What’s the most common dog door problem? The most common dog door problem is flaps needing replacement, and this is more frequent on lower grade pet doors that use cheaper materials. Even if the dog doesn’t chew the flap, it is likely to crack, warp, discolor, and sometimes even shrink with time. How big the problem will be depends on the climate, how many pets use the door, and how rough they are on the door. Some need to replace the flap once a year or more often, others get by with replacing flaps biannually. 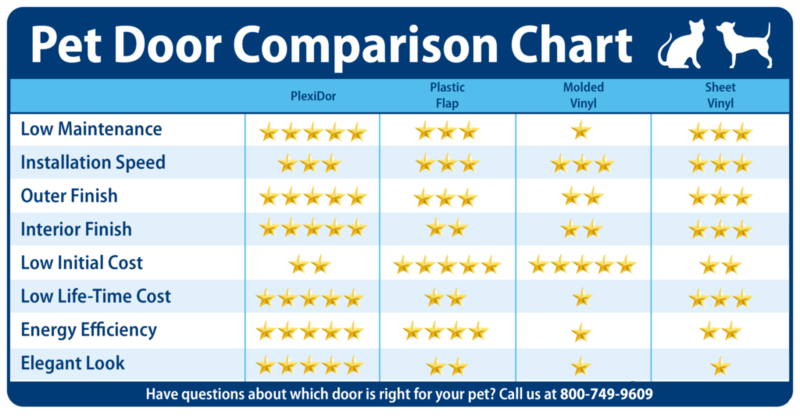 Before choosing and installing a pet door, decide what’s more important: do you want a low up-front cost and a door that will require maintenance, or a higher up-front cost and a door that will work for years? The pet door frame can also cause problems. Cheaper doors with plastic frames may crack during harsh weather. A door with aluminum frame will be more expensive to purchase, but will last for many years – often even decades – without major issues.